Part of finishing off this list of 100 essential superhero movies is bringing in my audience, and so when I got down to the last 20 movies, I decided that I would let you decide. And what better than to reach out to other movie critics and reviewers to let them argue the case for a superhero movie that they are a fan of and at the bottom of the post, there is a poll where you can vote whether or not you agree if it should be included in the 100 Essential Superhero Movies list. 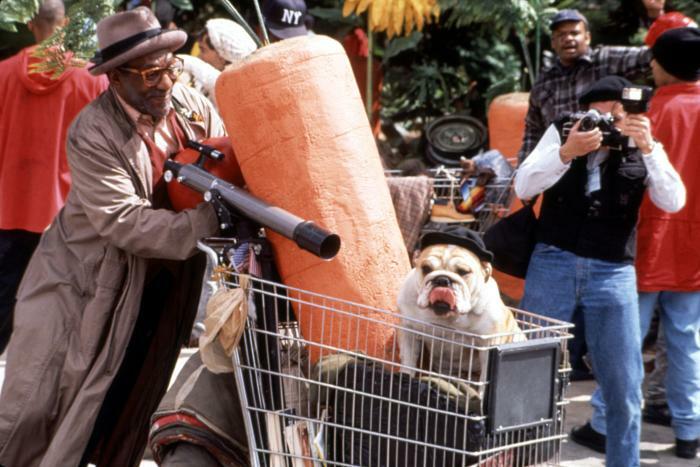 Today’s entry comes from TS Hendrik from The Non-Review and he takes a look at a movie that I quite enjoyed, The Meteor Man. Currently on IMDB The Meteor Man holds a 4.9/10 rating. On Rotten Tomatoes, the film stands at a pathetic 29%. Clearly these people don’t know what they’re talking about. Okay, so the film has a sort of clunky feel to it. It’s endearing. More importantly it knows what it is. It’s silly and camp, but in a timeless way because it was designed to be just that. It’s meant to have the feeling of a Saturday morning superhero. The ones you’d bounce of bed to find out their latest happenings. Jefferson Reed (played by Robert Townsend) is a hero that’s equal parts Superman and Jimmy Stewart in Mr. Smith Goes To Washington. Of course, unlike those characters, he’s not a white hero, fighting a white villain, and playing to a white crowd. He’s a rarity, a black superhero onscreen. Superhero films may have become better and better over the years, but one thing still lacking has been diversity. For every Hancock, there’s a thousand brooding white boys angsting it up on screen. Then there’s the urban backdrop which feels like Tim Burton’s ghetto alter ego had a hand in it. The tumbledown buildings have the grit and grime that’d feel at home in Gotham City. Only Batman would never bring himself to visit this neighborhood. Let’s face it, heroes like Batman and Superman, have a price tag, and it’s too high for most demographics. The only reason Bruce Wayne would be in their neighborhood, is if he was in D.C. to meet with the President and heard there was a great, little known BBQ shack nearby. On the other hand a hero like Jefferson Reed is interested in saving his neighborhood. He’s a school teacher who has the kids at heart. He wants to be the hero the people need to raise them up from the violent gangs that have put a stranglehold on his streets. A noble idea that eventually plays out in the climax, with the people coming to Jefferson’s aid when he finds himself powerless. I mentioned Mr. Smith Goes To Washington earlier, and indeed there seems to be a very Capra-ish undercurrent through out. I haven’t even mentioned the cast which includes small parts from Bill Cosby, James Earl Jones, Robert Guillaume, Sinbad, Luther Vandross, Naughty By Nature, Cypress Hill, Wallace Shawn, Chris Tucker, and Don Cheadle. This movie is packed with fun cameos. Now to be fair, it is still a comedy first. The gang of golden haired children known as the Golden Lords is all goof. Eddie Griffin as Jefferson’s less than brilliant friend is all joke. But what’s wrong with that? While DC has spent its last few years trying to go darker and more serious, a little levity and camp would be a breath of fresh air. Because that’s what comics ultimately are; idealistic heroes with ridiculous costumes and silly premises, that as kids we could dream upon. 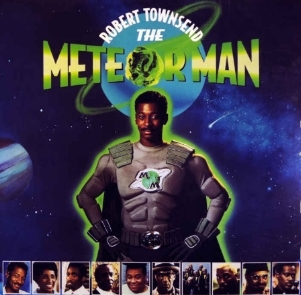 The Meteor Man, delivers on that childhood feeling, reminding us that heroes, even Batman with his gravely voice, are still just a men and women in colorful pajamas. For all these reasons and more, the film deserves its spot as one of the 100 Essential Superhero Movies. I personally agree with TS here, it’s a fun movie, a nice almost superhero parody that’s a dozen times better than Superhero Movie and it’s one of the few superhero themed movies that has a primarily black cast and black lead. A big thanks to TS for taking up this movie to support and now it’s up to you to help decide if it should be included in the list by voting Yes or No and the final list will be posted in full in June. Until next time, this has been Bubbawheat for Flights, Tights, and Movie Nights. Posted on May 1, 2014, in Blogs and tagged blogathon, movies, poll, Superhero. Bookmark the permalink. 13 Comments. Not all Superhero Movies need to be dark and serious. This is one of my favorite superhero comedies. There’s a handful of them and I’m not a fan of very many. I think I’d rather watch an Ed Wood movie than Meteor Man. No offense. How about Leonard Part 6? Is that a superhero movie? I haven’t seen Leonard Part 6 in ages! If you want to write up a defense for it, I’d love to hear it. There’s often a fine line between secret agent/spy and superhero and I’d have to watch it again to see where that one falls in my personal opinion. I have never had an interest in watching this movie until now. It’s heart is in the right place, but everything I’ve ever heard says it’s awful. Well you convinced me Tim! I’ll try and watch it! Thanks for hosting Bubbawheat! It does have a lot of detractors, but I have found a handful of people like me that enjoy it. If you go in knowing what you’re getting you just might enjoy it. I guess I would have to watch it again. I don’t even remember if it was really bad. It’s not the greatest piece of cinema out there, but I’m a fan. TS, you made a nice argument for this movie and I think you have talked me into watching it! Maybe I have low standards, but I liked it. Well if you do than so do I because I like it too.